Talent Acquisition is the process of finding, acquiring, assessing, and hiring candidates to fill roles that are required to meet company goals and fulfill project requirements. Talent Acquisition also ensures that newly hired employees are effectively and efficiently acclimated to the organization, enabling the organization to rapidly and fully benefit from their capabilities. 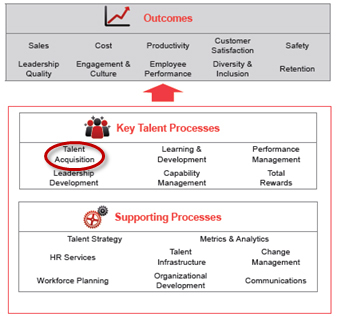 In the TDRp framework, Onboarding (and its associated measures) appears under Talent Acquisition. In many organizations, this process is owned by the Learning & Development function. Additionally, as role of Talent Acquisition has become more strategic, many organizations also encompass Workforce Planning in Talent Acquisition. For TDRp, Workforce Planning is treated as a supporting process and its associated measures are not included in the Talent Acquisition process. In practice, each organization is free to organize their human capital activities any way they choose. We simply need a framework to organize the measures. Each key process like Talent Acquisition contributes to the achievement of organization goals (for example, a 10% increase in sales or a 15% reduction in costs) and talent outcomes (for example, a 5 point increase in employee engagement or a 2 point increase in the retention rate). Often, some of the talent outcomes are top-level goals of the organization on par with an increase in sales or a reduction in costs. Other times, the talent outcomes are viewed as intermediate goals in support of achieving the top-level goals. TDRp is designed to work in either case. More than 100 measures are defined for Talent Acquisition. These measures are grouped by type of measure (efficiency, effectiveness, outcome) and across six subcategories. Each organization should choose the measures most appropriate to achieve their goals and manage their human capital. Talent Acquisition will typically support the broader organizational goals, as well as talent management focused goals. A short summary of each Talent Acquisition sub-category, including examples, follows. Requisitions – measures that assess the volume of requisitions and hires from a recruiter perspective. Applicants & Interviews – measures that quantify the sourcing and interviewing of candidates. Hiring activity – measures that assess the volume, types, and sources of hires made. Hiring cost – measures that calculate or compare the cost of hiring. Hiring process – measures that assess the efficiency or effectiveness of the hiring process itself. Quality of hire – measures that assess the quality of hires made. In addition to being grouped by TDRp category (efficiency, effectiveness, outcome), the measures have also been grouped into Tiers, which are described below. In choosing measures, we recommend starting with Tiers 1 and 2. Click here for a complete list of measures for Talent Acquistion. 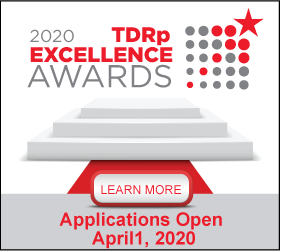 CTR members may also access the full electronic version of the TDRp Talent Acquisition Measures Library , which provides definitions, formulas, comparable measures, and complete references to source documents for a detailed discussion of each measure. The white papers Introduction to TDRp and Extending TDRp to All Key Human Capital Processes are highly recommended. Since the TDRp initiative began with a focus on Learning & Development, more has been written for L&D than for the other key processes. The Tips and Tools for L&D, however, will also be helpful for understanding how to construct the various statements and reports for Talent Acquisition. With time, advice pieces will be written for each key process. Notes:(1)The other five key human capital processes are Talent Acquisition, Learning & Development, Capability Management, Leadership Development, and Performance Management. Workforce Planning and Demographics has also been included as a key supporting process. For more on the TDRp framework see Introduction to TDRp and Extending TDRp to All Key Human Capital Processes.